Just a third of Americans have a favorable opinion of the federal government, the lowest positive rating in 15 years. Yet opinions about state and local governments remain favorable, on balance. As a result, the gap between favorable ratings of the federal government and state and local governments is wider than ever. Ten years ago, roughly two-thirds of Americans offered favorable assessments of all three levels of government: federal, state and local. But in the latest survey by the Pew Research Center for the People and the Press, conducted April 4-15, 2012 among 1,514 adults nationwide, the favorable rating for the federal government has fallen to just 33%; nearly twice as many (62%) have an unfavorable view. By contrast, ratings of state governments remain in positive territory, with 52% offering a favorable and 42% an unfavorable opinion of their state government. And local governments are viewed even more positively. By roughly two-to-one (61% to 31%) most Americans offer a favorable assessment of their local government. Although favorability ratings for state governments declined between 2008 and 2009 as the financial crisis hit, they have remained steady over the past four years. Consequently, the gap between ratings of state governments and the federal government has grown. While the balance of opinion toward state governments is favorable, majorities say their state government is not careful with people’s money (56%), is too divided along party lines (53%) and is generally inefficient (51%). But much larger percentages fault the federal government’s performance in those areas. Moreover, while more say their state government is mostly honest rather than mostly corrupt (by 49% to 37%), a majority (54%) says the federal government is mostly corrupt. The overall decline in favorability toward the federal government in Washington is consistent with other views of government. Recent Pew Research Center studies have shown overall public trust in government at or near all-time lows (See these reports from 2011 and 2010.). And a survey conducted in January 2012 found ratings of Congress have also reached historic lows. While Republicans offer an overwhelmingly negative assessment of the federal government in Washington, they take a far more positive view of state governments than do either Democrats or independents. Among Republicans, more have a favorable than unfavorable view of their state government, by a 62% to 34% margin. Democrats (50% favorable, 45% unfavorable) and independents (49%, 44%) are divided. The higher ratings among Republicans overall are driven by the strong satisfaction Republicans feel in the 21 states that have Republican leaders at the helm. Fully 70% of Republicans and Republican leaners in these states give their state government a favorable rating. Republicans states are those that have Republican governors and Republican majorities in both state legislative chambers; among the largest are Florida, Georgia, Ohio, Pennsylvania and Texas (see appendix at the end of this report for a full list of states). By contrast, in the 11 states with unified Democratic control (the largest being California, Illinois, Washington and Massachusetts), just 33% of Republicans and Republican leaners offer a favorable rating. 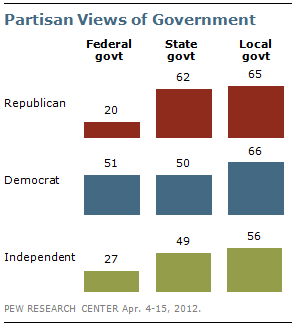 Democrats’ views of their state governments are less correlated with the political makeup of the government. In the 11 states with Democratic governors and Democratic legislative majorities, 55% of Democrats and Democratic leaners rate their state government favorably; in states with Republican governors and Republican legislative majorities, 43% feel favorably toward their state government. State governments receive more positive ratings than the federal government across a range of performance-related traits. In a separate survey, conducted April 19-22 among 1,004 adults, more people describe their state government as mostly honest (49%) rather than mostly corrupt (37%). Evaluations of the federal government run in the opposite direction: 54% say it is mostly corrupt, while just 31% say it is mostly honest. 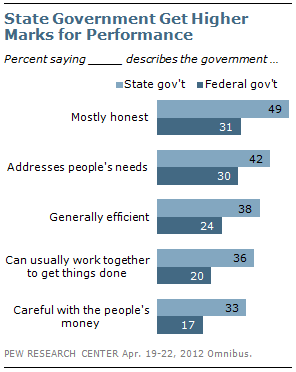 More say state governments address people’s needs (42%) than say the same about the federal government (30%). State governments are also seen as more efficient (38%) than the federal government (24%). Partisanship is seen as a bigger problem at the federal level than at the state level. Three-quarters (75%) say the federal government is too divided along party lines, with just 20% saying the federal government can usually work together to get things done. State governments get substantially less negative ratings; 53% say their state government is too divided along party lines, while 36% say it usually works together to get things done. Just one-in-three (33%) say their state government is careful with people’s money, but that is nearly double the 17% who say the federal government is careful with people’s money. Mixed party control of governorship, state House, state Senate. This includes states with a nonpartisan legislature (NE), states with no majority (ties) in one or more chambers (AK, OR, WI), and states with independent governors (RI). Wisconsin results reflect outcome of recent recall elections. Source: National Conference of State Legislatures, March 19, 2012.